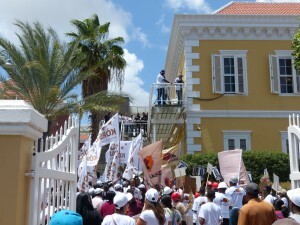 WILLEMSTAD – Several parties both with and without representation in parliament have indicated that they are preparing for the upcoming elections. Parties without representation like FOL, PAS and UPN said that they will participate in the elections in April this year. Some other parties without representation are still considering their participation. Even the old party DP is working on the requirements to be able to participate. DP presented an all-female list for the elections of October 5 last year. They did not want to comment about their candidate’s list this year. The leader of 1 Team Magno, the brother of the former political leader Helmin Wiels, Aubert Wiels said that his party has not made a decision yet as to whether they will participate in the upcoming elections. They will have to evaluate internally first. Former Prime Minister of Curaçao Ivar Asjes already stated last week on his Facebook Page that he will not be active in politics anymore. All parties have until March 10 to present their candidates.